In this article, we are going to explain Code First Migration in ASP.NET Core MVC 6 with EntityFrameWork Core, using Command Line Interface ( CLI ). We are going to create a sample Code First Migration project in ASP.NET Core 1.0. Model class given below contains the properties of the user details in our Applications. 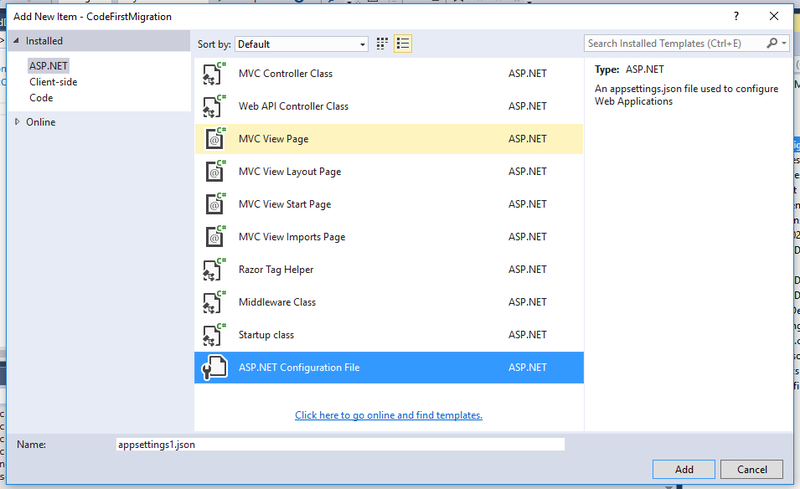 In the previous versions, everything is handled by Web.Config but in ASP.NET Core, the connection string is written in appsettings.json file. By default, it will show as a LocalDB path and as per our requirement, we can change the connection string path. In the way given below, we can create connection string in ASP.NET Core 1.0. The code givden below contains the information about EntityFrameWork Core DbContext. We can add the LocalDB connection string details with the help of “UseSqlServer” Method. 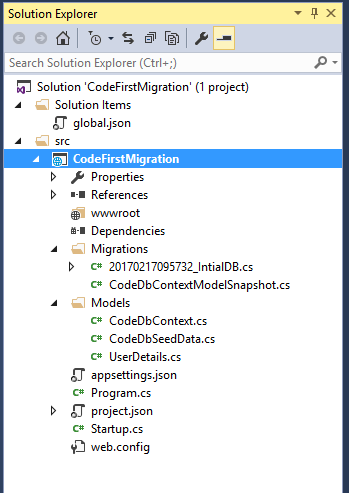 We are going to implement Code First Migrations in Entity Framework Core to seed the database with test data and manually we are entering the seed data information in the “CodeDbSeedData” class. The code given below contains the default values of User Details Table in our Application. Company = "HappiestMinds Technologies Pvt Ltd"
project.json contain the complete picture of dependency in our Applications. The class given blow contains the complete middleware details in our Applications. The steps given below will explain the step by step Code First Migration in EntityFrameWork Core. The command given below will help to change our current “C Drive” to “F Drive” because currently our Code First Migration project is saved into “F Drive”. The command given below will display for more information about dotnet ef command. We are going to start with new EntityFrameWork migration, using the command given below. The command given below will update the EntityFrameWork Core database in ASP.NET Core Application. The structure given below will be created after the ef migration in .NET Core. The Dotnet EntityFrameWork CLI ( Command Line Interface ) creates the Local DB as “UserDB”. Go to “View” and select “SQL Server Object Explorer” in Visual Studio. 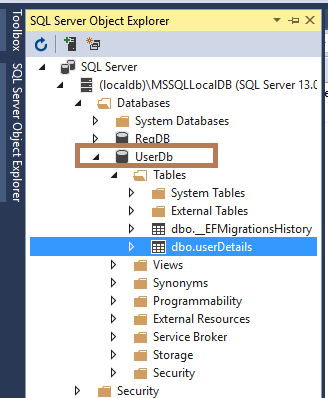 Now, expand “SQL Server -> (localdb) -> Databases -> UserDB”. We learned about Code First Migration in ASP.NET Core MVC 6 with EntityFrameWork Core, using Command Line Interface ( CLI ) and I hope you liked this article. Please share your valuable suggestions and feedback.